Lordy, Lordy! Look who’s 40! ME! I am celebrating my Halloween Birthday with this stunning Butter Cake with Chocolate Frosting. Who said kids are the only ones who gets to have a fun birthday cake? I wanted a colorful and amazing birthday cake for my special day, so I had a blast decorating this and making a total mess in my kitchen. 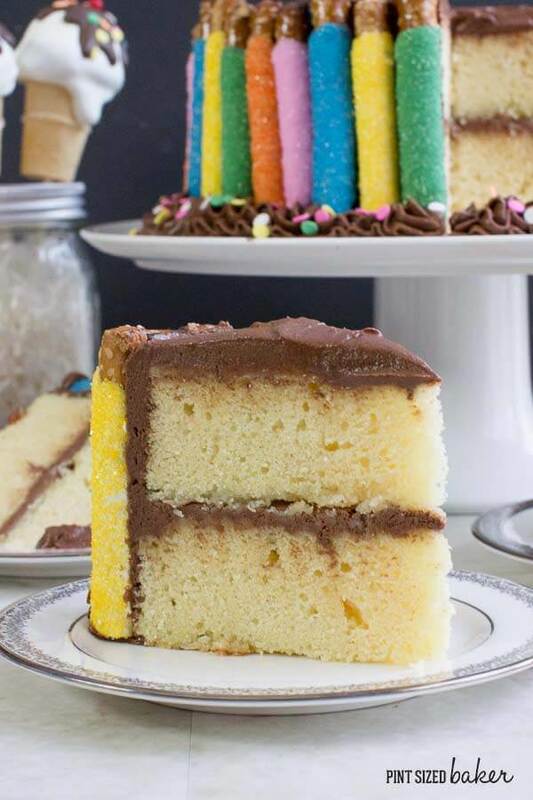 A yummy Butter Cake with easy Chocolate Frosting makes an amazing Birthday Cake! Preheat the oven to 350F and prepare two 8-inch round pans with non-stick baking spray and wrap with bake right strips. In a mixer bowl, cream the butter and sugar for 5 minutes. Add in the eggs, one at a time and mix in. Beat in the vanilla extract and vanilla bean seeds. Add in ⅓ of the flour mixture followed by ½ of the milk. Blend. Add ⅓ flour and remaining milk and blend. Min in remaining flour until just incorporated. Divide between the two pans and bake for 40 minutes. Cool in the pan for 10 minutes then remove from the pan and cool on a wire rack. Wrap the cooled cakes in plastic wrap and refrigerate overnight. In a stand up mixer, cream the butter, cocoa powder and salt for three minutes until thick. Scrape down the sides and add in 2.5 cups of the powdered sugar. With the mixer on low, add in the milk and vanilla extract. Gradually increase the speed of the blender as the sugar is incorporated. Scrape down the sides to fully incorporate. Mix together the heavy cream and malt powder. Slowly pour the mixture into the chocolate frosting and whip. Add any remaining powdered sugar to thicken the frosting if needed. Frost the cake and decorate. Brake large pretzel sticks in half and dip in melted colored candy and coat in sugar sprinkles. Make the Fruity Pebbles Bars and press half the mixture into a 6-inch cake pan. 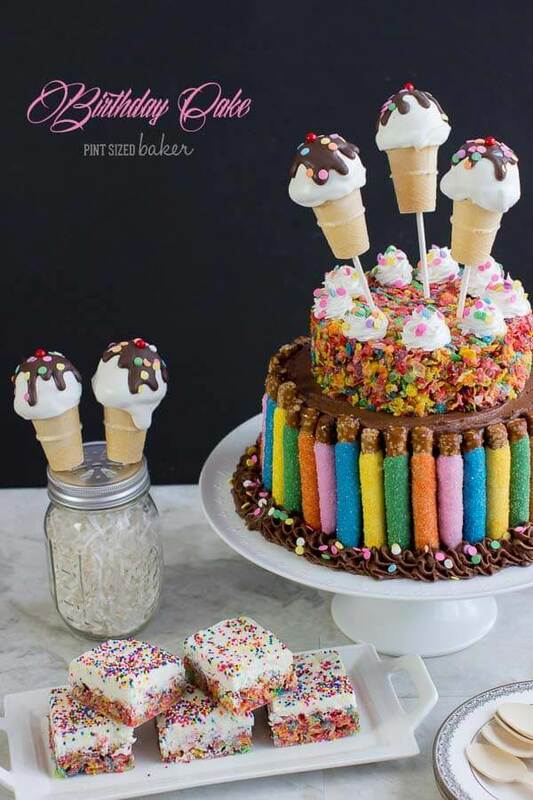 Make your Ice Cream Cone Cake Pops. Place the pretzels around the perimeter of the cake - I used 40 pretzel sticks around my cake. 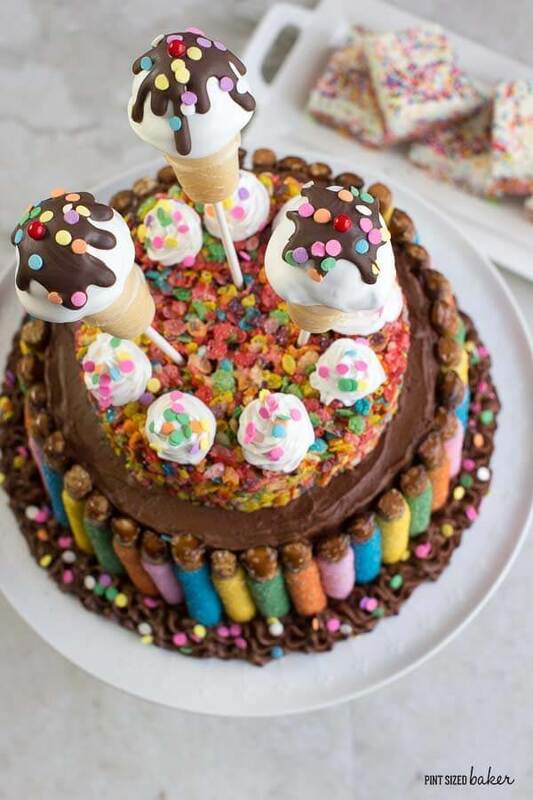 Top the cake with the Fruity Pebbles "cake" on top with cake pops standing up. 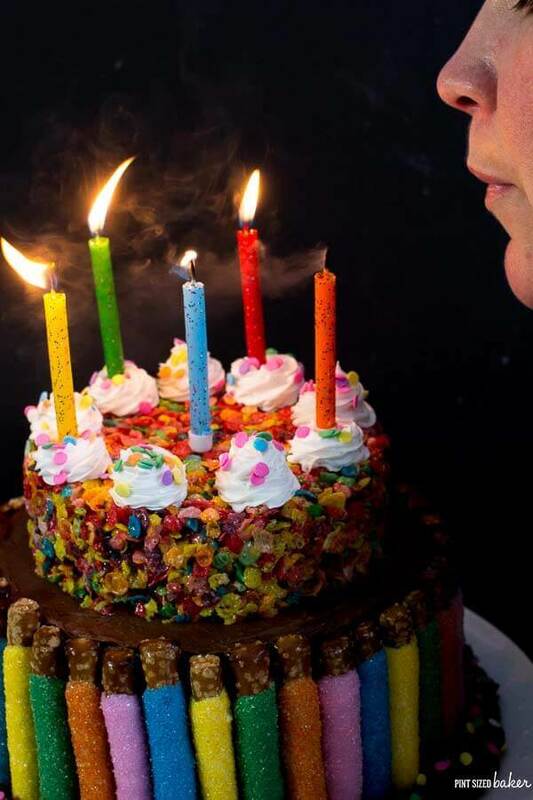 Make a wish and blow out the candles! This vanilla butter cake with chocolate frosting was just the most perfect birthday cake that I could think of this year. I had intended to make it a funfetti cake and add sprinkles to the inside as well, but forgot to add them while baking. Go figure. 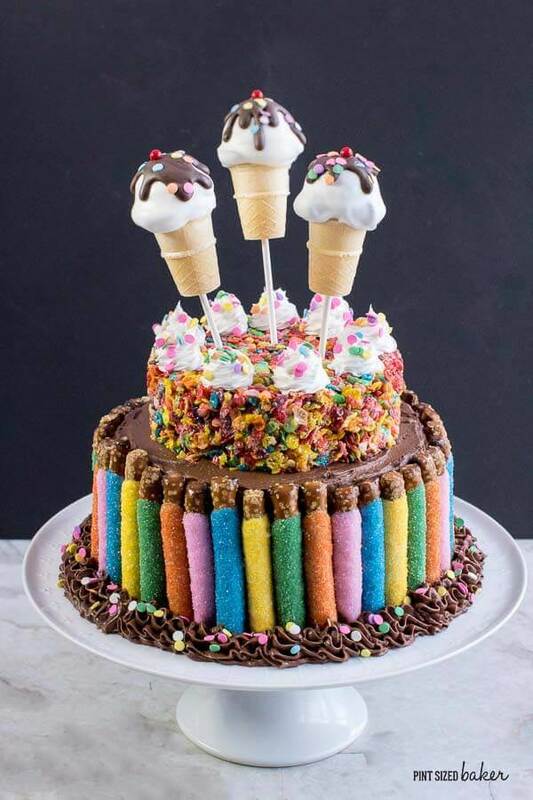 You can totally add some rainbow jimmies to your cake to have a fun explosion of color on the inside as well. Here’s a Tip – If you want a funfetti cake and you don’t want the colors to run while baking, take a tablespoon of flour and toss it in a baggie with your sprinkles. Completely coat the sprinkles and then gently fold them into the batter at the very end right before pouring it into the cake pans. This cake was rich and buttery, full of vanilla beans and dense with a light crumb. Using the Bake Right Strips helps to make the cake bake flat on top without creating a domed top that you just lop off. The chocolate frosting has the addition of a hint of malt powder which just boosts the chocolate flavor a bit without changing the flavor to be too malty. 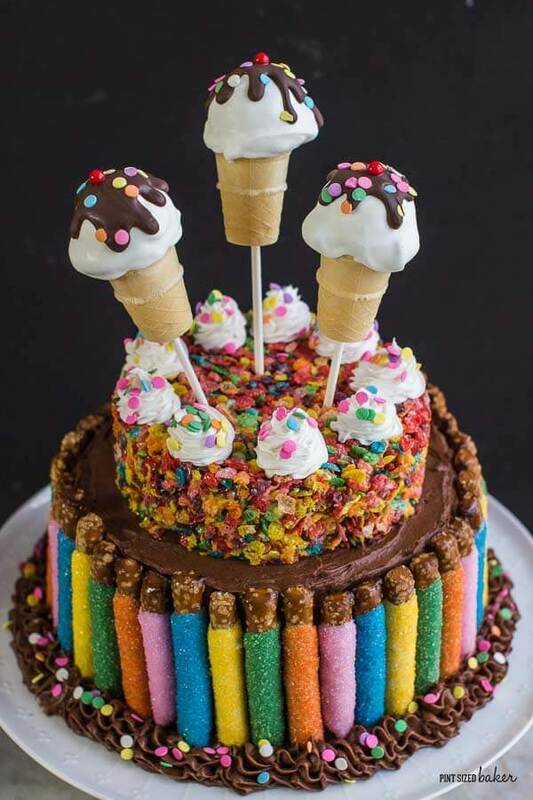 This cake was made to put a smile on your face and make you forget about getting “older” and remember all the wonderful things about being alive! Sometimes I think that I – we- think about things too much and we don’t take the time to reflect on how great our lives have been. I’ve been here for forty years. I’ve was an outstanding child, a brilliant teenager, a successful flight instructor, and an ingenious entrepreneur. I have a great husband and my daughter is as amazing as I was. This blog has transformed my life from a time of depression and despair to new friendships, new experiences, and a new career. I know this may sound cheesy, but I’m feeling pretty blessed today. To celebrate this major event in my life, my husband and I took a weekend trip to the Big Apple. We are in a swanky uptown hotel, traveling over the city, going to World Trade Center Memorial, and we are headed off to see Wicked on Broadway! I am so thrilled!! I’ve been wanting to do this for several years and now it’s here and it’s happening. Yippy!! Here’s to another decade and new chapter in my life. I welcome the 40’s with open arms and big smile on my face! 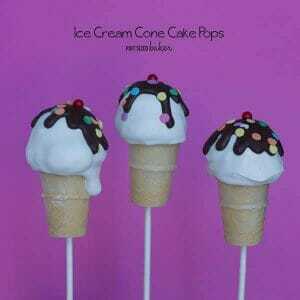 You can find the instructions to make the ice cream cone cake pops here. 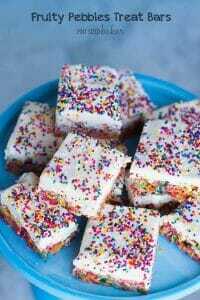 You can find the recipe for the Fruity Pebbles Bars here. Happy birthday! What a beautiful birthday treat! Happy Birthday Karyn! I love the cake! I am hoping next time I will get a slice! ha Thank you for linking up at the Tips and Tricks Link Party! I can’t wait to see what you post this week! Thanks so much for the Birthday wishes! I’d be happy to share any and all of my treats.